Postcards made by the artist flew from lines across the walking path. Ava Werner created a series of about 300 individual 5″x7″ collages. 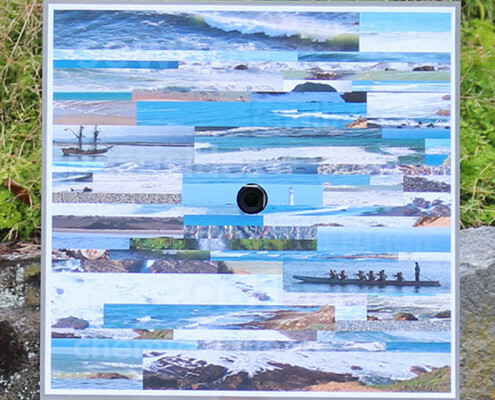 Each one is unique and features images from the rivers and water bodies surrounding New Plymouth, New Zealand. The cards are each labelled with a different number in the order they were made. The numbers relate to the number “1881”, to symbolize the year that Parihaka choose to use passive resistance as a tactic against the settlers of the region. The cards hung across the Huatoki walkway confronting the viewer. On the back of each card were questions such as, “What water do you come from?” which is a traditional way Maori greet each other, or “Tell your water story”. The participants were encouraged to take a card with them, and give back to the exhibit by giving a response to the questions or the theme of water and peace at a series of cameras located around the installation area. The video installations were developed as collaboration with artist Jim Werner. The work was temporary, and slowly dismantled through the process of viewers removing the pieces. This act of taking the artwork and being asked to give something (a video narrative) in return also symbolizes how we take from our resources, rarely considering the consequences or implications of our actions. Ava Werner’s installation was integrated with the work by James Werner.